Microsoft Surface Pro 6 is a great 2-in-1 device with the most powerful performance Surface Pro ever built by Microsoft. It packs with a quad-core 8th Generation of Intel Core processor. Sure, it does has better performance, longer battery life, better display, new black color design, and more. However, one thing that doesn’t change is the limited ports remain the same. A single USB-A port on Surface Pro 6 will sure be an issue when you want to connect multiple devices simultaneously. A USB hub or docking station is a great way to get more accessible ports on your Surface Pro 6. 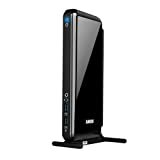 If you are looking to expand your device’s connectivity, here we have what you’re looking for. 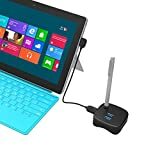 Below is the list of our best picked portable Surface Pro 6 USB hubs and docking station with a variety of unique features. 4 x USB 3.0 ports with 5.0Gbps data transfer speed. The swiveling connector can be rotated up to 180 degrees. Made of a premium aluminum housing. The first one of our list is a USB 3.0 Hub from MAKETECH. This USB hub features a super slim design with only 0.33-inch depth that is exactly as same as the 0.33-inch Surface Pro 6 thickness. It has 4 USB 3.0 ports that can preserve the full speed of your current USB 3.0 port. 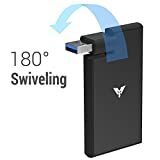 This device also has the swiveling connector that allows you to rotate the USB connector up to 180 degrees. 1 x Surface Pen dock. 2 x USB 3.0 ports with 5.0Gbps data transfer speed. 1 x SD/TF card slot. 1 x USB 3.0 Micro-B (input). Ultra compact with beautiful and elegant. Easy to store your Surface Pen. Made of premium aluminum housing & ABS Plastic. While the Surface Pro 6 has a touch and pen support, addition of Surface Pen storage will definitely benefit you. This portable multi-function USB Hub from Chronox comes with a unique design that included a Surface Pen slot that can hold your pen while not in use. 2 x Micro SD/TF card slot. 1 x optional external power supply via Micro-USB port. Easy to transfer between USB devices and memory cards. Highly portable with slim design. Charging connector won’t shelter by the hub. Compatible with Surface Pro 6 / Pro 5 / Pro 4 / Pro 3, Surface Book / Book 2, Surface Laptop / Laptop 2, and Surface Go. 1 x Gigabit RJ45 Ethernet port. 1 x HDMI ([email protected]). 1 x DisplayPort ([email protected]). Specifically designed to fit Surface Pro 6 / Pro 5 / Pro 4 and Surface 3. The most lightweight Dock for Surface Pro 6. This dock has a sleek and modern look with a vertical design easy to stand right next to the monitor. 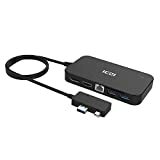 It provides a number of ports including 2 USB 3.0, 4 USB 2.0, HDMI, DVI (can be converted to VGA with included adapter), Gigabit LAN port, earphone, and mic audio sockets. Anker makes reliable products. This USB 3.0 universal docking station is no exception, it features a slim and premium design with dual displays support. Looking for an affordable docking station solution? 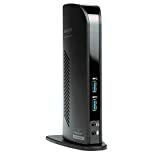 Check out this AmazonBasics USB 3.0 universal docking station. It has all the features you can expect from a dock. 1How many USB ports on Surface Pro 6? Microsoft Surface Pro 6 has only 1 x full-size USB 3.0 port that has a maximum bandwidth rate of 5 Gbps (gigabits per second) or 640 MBps (megabytes per second). 2What is different between USB 2.0 and USB 3.0? 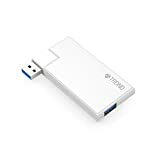 USB 3.0 is a newer USB (Universal Serial Bus) standard which provides faster transfer speed 10 times faster than USB 2.0 which rated at only 480 Mbps. 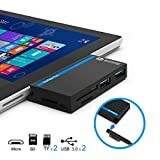 3Can I use a USB 2.0 device with Surface Pro 6? Yes you can, Surface Pro 6 with USB 3.0 are backward compatible with all previous version of USB including 2.0 and 1.0. 4What is a USB Hub? 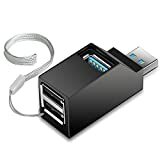 A USB Hub is a device that can expand the number of USB ports on a PC that allows users to connect more devices simultaneously. 5How many types of USB Hub? Self-powered USB hub: is a hub that derives power from a dedicated power source to supply power to the hub itself and its connected devices. 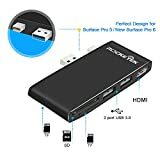 Bus Powered USB hub: is a hub that draws power from the connected host machine (Surface Pro 6) to the hub itself and its connected devices. 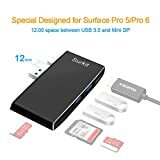 6Why do I need a USB Hub for my Surface Pro 6? 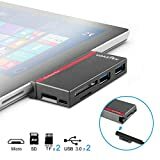 Connect multiple USB devices: Using a USB hub can help you to connect your Surface Pro 6 to an external USB keyboard, USB mouse, USB drives, or a printer at the same time. More connection interfaces: Some hubs have a built-in Ethernet port, Micro SD, SD port, audio, and more, so you can connect your Surface Pro 6 to more device interfaces that not possible before. Carrying around with a portable USB hub will definitely help you to deal with the lack of connectivity options of your Surface Pro 6. While the docking station will give you instant access to all of your connected peripherals when you are at home or work. All our recommended USB hubs and docking station here are all perfectly design to fit and work well with Surface Pro 6. We are sure you will happy with your pick from our list. 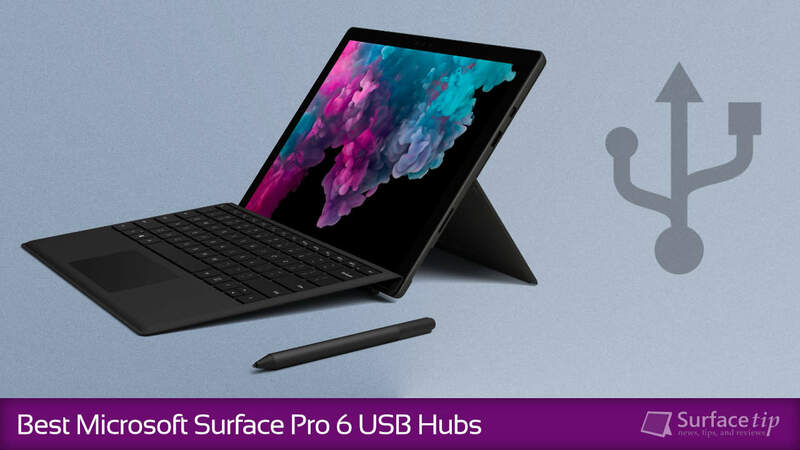 We appreciate hearing your thoughts, questions, and ideas about “The Best Surface Pro 6 USB Hubs and Docks in 2019”. Please post respectful comments and on topic. We will be replying back to you as soon as possible. Share your idea about "The Best Surface Pro 6 USB Hubs and Docks in 2019".